Loren Bolinger (of the Talismen) played with the band for awhile. Pam Cartwright was an honorary “kid”. She was their Go-Go dancer at their shows. I met Bob & Bill Burns in downtown Wenatchee, at a music store. They said they were starting a band and needed a lead guitar player and a bass player. I signed on as their bass player, but only knew a few chords on guitar but nothing about bass. My dad bought me a silvertone bass and amp and I was in. I knew Bob Gourley, he was an excellent guitar player for a kid, and he fit right in. I can’t remember how Mike entered the band but we were a full band now. Bob & Bill’s dad booked bands from all over the northwest for armory dances on weekends. He promoted us alot so we started to get popular right from the beginning. My dad got a new job in Spokane & my family moved, so that ended my stint with Billy & the Kids. I was surprised & delighted to see your site. Keep up the good work! guitar, lead singer Mike Rice, lead guitar man Bob Gourlie, and Ken Laymance on the rhythm guitar. An attractive and vibrant “go-go” girl, Pam Cartwright, joins the group for public appearances. “Billy and the Kids” demonstrated exceptional poise on their first professional recording endeavor. “They play the good hard rock as well as any group I’ve ever heard,” was the appraisal made by veteran Wenatchee disc jockey Don Bernier, who helped launch the professional careers of these teenagers by recording ‘It’s Not the Same’ on the Julian label, a Bernier enterprise. Click here to see some photos of the group! 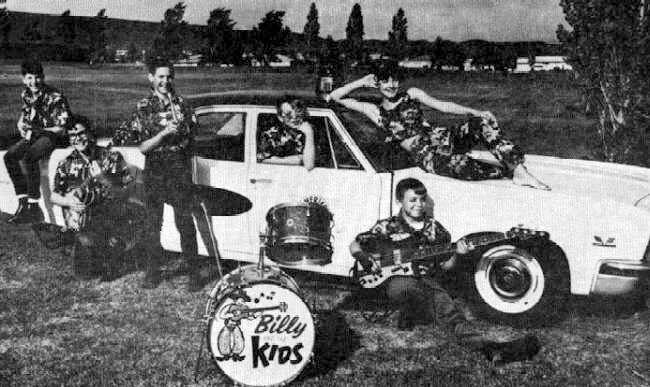 If you have any information on Billy & the Kids that you would like to share, send me an email at Julianrecordsinfo@gmail.com or leave a comment below! I am a huge chargers fan and follow them. Would be awsome if Billy and the Kids could get together and play a little old time music also! !